We gather each Sunday to hear readings from the Bible, to hear a sermon reflecting on those readings, to join together in prayer, and then to receive blessed bread and wine, also known as The Lord’s Supper or Holy Communion. 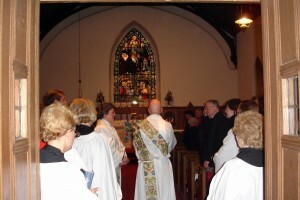 At the 10 AM service, our music is enriched by the choir and singing of hymns. Children are encouraged to participate in Sunday worship at age appropriate levels. Immediately prior to Sunday School, at 9:45, a brief Children’s Worship is shared in the parish hall. After 35-40 minutes of Sunday School, the children join their parents in the church so that they can receive Communion. Periodically throughout the year, Family Services are scheduled where the children participate by singing in the Angel Chorus (Children’s Choir), reading lessons, leading prayers, and assisting the ushers. Sunday services will be cancelled should a road emergency state exist for Glen Arm or Northern Baltimore County. A notice regarding cancellation will be placed on the church answering machine as soon as possible prior to Sunday Services.